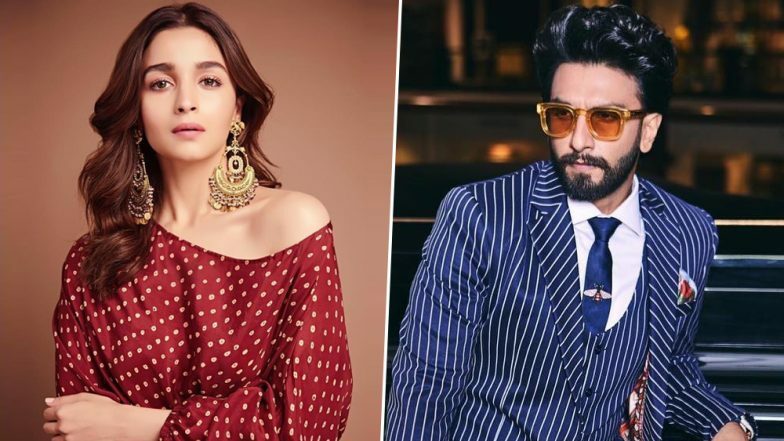 Alia Bhatt and Ranveer Singh to Come Back Together for the Third Time After Gully Boy and Takht? Alia Bhatt and Ranveer Singh are a blockbuster hit when they come together on the silver screen. While Alia is among the most versatile actors, Ranveer is known for his intensity and passion. We all witnessed the grandeur product of both the actors coming together in Gully Boy. Zoya Akhtar’s Gully Boy was one of the most applauded as well as bankable movies of the year, but what struck a chord with the fans was the beautiful chemistry of Alia and Ranveer. Rumours are ripe that the duo has been approached for a third film together. Ranveer Singh Raps Gully Boy Songs Along With Harrdy Sandhu and Team '83 at a Dharamshala Restaurant - Watch Videos. Ranveer and Alia will be next seen in the multi-starrer big-budget period film Takht. The movies also stars Anil Kapoor, Janhvi Kapoor, Kareena Kapoor Khan, Bhumi Pednekar and Vicky Kaushal in lead roles. The movie comes as another Karan Johar big project. Now, rumours have it that the Gully Boy stars have been roped in together for a third film. Yes! We are quite as excited as you are with the happy announcement. According to a report published in PinkVilla, the actors have already signed on the dotted lines and the same is a big-ticket movie under a famous banner. However, there are no official confirmations regarding the same. On the work front, Ranveer is busy with the shoots of his upcoming biopic ’83. Based on the true story of 1983 World Cup Cricket, in which India brought home the victory, Ranveer essays the role of former cricket captain Kapil Dev. Alia, on the other hand, has many films in her kitty. The actor is gearing up for her upcoming film Kalank, co-starring Varun Dhawan, Aditya Roy Kapur, Sonakshi Sinha, Madhuri Dixit and Sanjay Dutt. Alia Bhatt Reacts to Getting Criticized for Pairing up With Salman Khan for Inshallah, Says it Doesn't Bother Her. Alia will later begin with the shoots of Sadak 2 and RRR. The actor will also be seen opposite real-life beau Ranbir Kapoor in her December release Brahmastra. We hope that the rumours are true, so that Alia and Ranveer come together for yet another magical movie. Till then, stay tuned with Latestly for more updates from your favourite celebrities.